Inspiration. Empowerment. Connection. The power of bicycle travel. Come find all of these at a special regional gathering of people interested in cycling and bicycle travel hosted by Adventure Cycling Association at the Hollywood Senior Center in Portland, Oregon on Tuesday, October 23 from 7:00 to 9:00 PM (program starts at 7:30 PM). 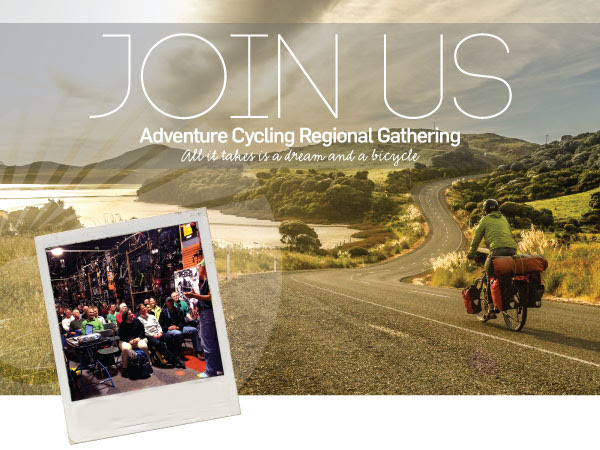 This gathering is open to Adventure Cycling members and nonmembers who have an interest in bicycle travel or just want to learn more. Adventure Cycling’s Travel Initiatives Coordinator Saara Snow will be on hand at the gathering at the Hollywood Senior Center on Thursday, October 23. Enjoy refreshments and a chance to socialize with many other folks in your area who interested in bike travel. Please join us and bring a friend! When: Tuesday, October 23 from 7:00 to 9:00 PM. Mingling starts at 7:00 PM, and the program starts promptly at 7:30 PM. Where: Hollywood Senior Center, 1820 NE 40th Ave., Portland, Oregon 97212. Please RSVP at info@adventurecycling.org or 406.532.2751 by October 21. We look forward to seeing you in Portland, Oregon!